I spent one day this week with my two grandsons, age 13 and age 14, visiting the Warren Dunes (at the bottom of Lake Michigan) in Michigan. The weather was cold (61 degrees) and windy. We ate a picnic lunch in the car and laughed at the seagulls, which were valiantly flapping their wings against the wind and flying NOWHERE. 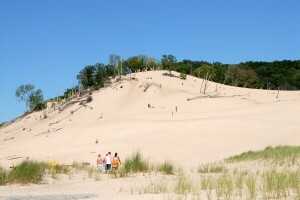 The boys climbed to the really high peak of the sand dune while down below I guarded jackets and gym shoes. Then we left, because it was so cold, to improvise the rest of the plan for the afternoon—a stop at an antiques mall (can you imagine two boys wanting to roam through an antiques store with their grandmother? ), then a drive up to the resort town of South Haven. I realize that I have had so much death and sorrow and stress over the last year that I am just hungry to spend time with my grandchildren. So we are researching tether ball sets, doing Internet searches (YouTube has a wonderful video on making your own set), figuring the amount of concrete needed to provide stability in the three old tires I’ve put aside for this purpose. Discussions were also held as to bringing the whole family back to the dunes; kites certainly should be hauled up in the car, boogie boards to slide down the sand, etc. Satisfaction. I guess a successful day is when your teen grand kids want to do it again. Thank God. On a Kickstarter note, we would love to meet our third Stretch Goal of $27,750. 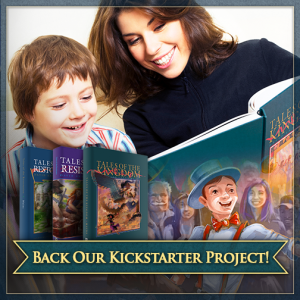 But meeting the 4th Stretch Goal of $29,750 gives us enough funds on Tales of the Kingdom to provide a workbook for kids (grade-school age) and parents and teachers. The workbook was designed by Mary Peterson, former teacher who taught Tales of the Kingdom in public school. She and a colleague put the workbook together as a gift. The world is filled with wonderful people. This guide enables you to spend more valuable learning time with your kids—it extends the reading experience in a most professional way. Stretch Goal $31,750 provides a workbook on Tales of the Resistance; the final Stretch Goal of $33,750 provides us with a workbook on Tales of the Restoration. All Backers receive these. Blowing past the $33,750 also makes us #16 in the U.S. for the most-funded children’s-book projects – and #19 on Earth. Guess what I’m praying about.